Alicante is a beautiful city at the Mediterranean Sea, founded by the Greeks, conquered by the Romans and rich in tourist attractions. We offer two modern apartments furnished 100m² in the modern center of Alicante, 900 meters from the beach in a quiet area, Calle Portugal, 34. The apartments are located between the Corte Inglï¿½s department store and the harbour. Calle Portugal is located in the vicinity of the new square, at the site of the former bus station. Today it is a green area. The building is from 2007 and the apartments offer many amenities such as marble floors and smooth walls. 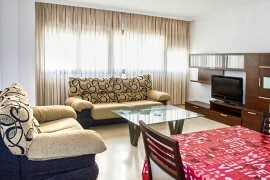 Both apartments are fully air-conditioned, have large living room and WIFI. On the corner you find a bus stop served by three lines in all directions. 30m away from the apartments there is a taxi station. A Mercadona supermarket is located 100m from the apartments. With BenidormHolidayRental you can rent your holiday apartment in Alicante and spend the winter months on the Costa Blanca. 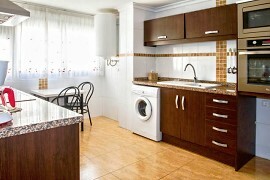 Here you will find prices and availability of our holiday apartments in Alicante, Spain. If you wish to book a holiday accommodation or would like information about holidays in Alicante, please use our contact form. Deposit of €100. Will be returned at the end of your stay after receiving the keys back and checking the apartment.